Buy Hive and PriceWatch, Buy this board game at the Lowest Price. Hive is a board game without a board. The board, so to speak, is created over the course of the game by placing your pieces (This is nice for people that don't like a lot of set-up in their games, cause this game has NONE). Each player has access to 11 hexagonal pieces with different bugs printed on them. Each bug has a different way of moving (think chess). Players introduce and move bugs around the board in an effort to completely surround their opponents Queen. It's a simple idea but adds a couple of interesting twists to keep it interesting. So like chess you have access to different classes of pieces, except here you're dealing strictly with bugs. The Queen is exactly like her chess counterpart, only able to move one space in any direction. The spider can move three spaces in any direction, no more no less. The grasshopper can jump over lined up pieces and is good for getting to the other side of the hive in a hurry. The beetle can actually climb on top of the hive and trap whatever is underneath it. Finally the soldier ant can move any number of spaces as long as he stays on the outside of the hive and not into the center. The ants are great for endgame play since the hive is much to large for something like the spider with his 3 move limit. The object of the game is for you to surround your opponents Queen and this can be done with both you and your opponents pieces, it doesn't matter as long as it's completely surrounded. 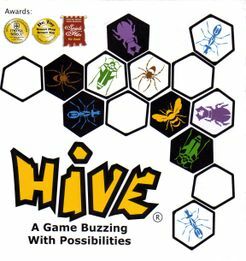 The thing about Hive is both its most interesting element and the name of the game itself. As players add new pieces and move around existing ones they must keep the Hive in one piece. If there are 3 pieces in a line then the middle one is stuck and can't move, since doing so would create a gap between the 1st and 3rd pieces. This property helps define the gameboard and also gives players the ability to strand strong pieces on their opponents side. As the game progresses the Hive begins to coil outward and you attempt to strand each others pieces while simultaneously trying to trap the Queen. It's a cat and mouse game that never lasts that long. The nature of the pieces and the movement means you can only run for so long before someone gets trapped in. Games will typically last 15-20 minutes. It's a good filler game or one you can play a few times in a row. The game is fast and fun, and after one or two plays you start to see the strategy. Protip: go on the attack early. A few well placed bugs can render the queen unable to move then it's just the process of getting her surrounded. Leaving her unable to move pretty much puts the game out of reach. This aspect makes the game alot of fun since it forces action (as opposed to chess where you let things play out longer) this also exposes some of it's problems. One or two bad moves early can essentially lose the game for you, so while I'd call it a fast and fun game I don't think I'd call it especially deep. Sill, deep isn't something you should expect out of a game that takes 15 minutes to play.